With the return of the exiles from captivity the religious instruction of the people was put into the hands of the Levites (Neh. viii. 7-9; II Chron. xvii. 8, 9; xxxv. 3). These functionaries were called ("teachers"). In all probability the language of instruction was still Hebrew (Friedmann, "Onkelos," p. 81, to the contrary). 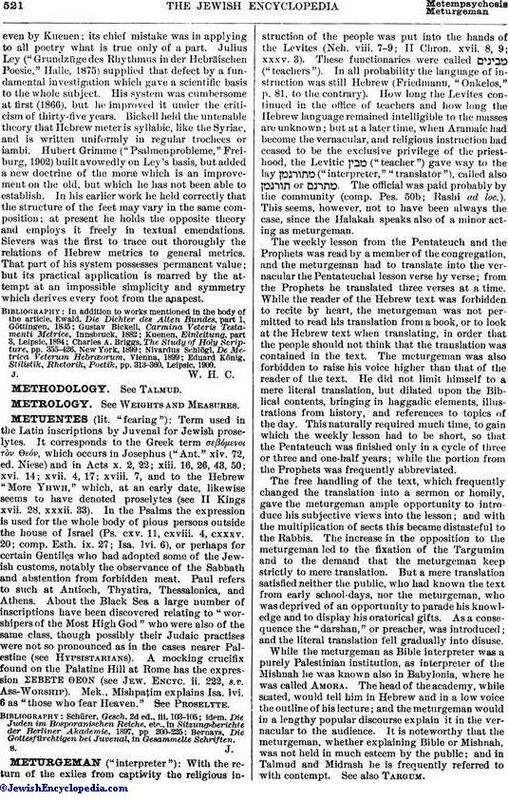 How long the Levites continued in the office of teachers and how long the Hebrew language remained intelligible to the masses are unknown; but at a later time, when Aramaic had become the vernacular, and religious instruction had ceased to be the exclusive privilege of the priesthood, the Levitic ("teacher") gave way to the lay ("interpreter," "translator"), called also or . The official was paid probably by the community (comp. Pes. 50b; Rashi ad loc.). This seems, however, not to have been always the case, since the Halakah speaks also of a minor acting as meturgeman. The weekly lesson from the Pentateuch and the Prophets was read by a member of the congregation, and the meturgeman had to translate into the vernacular the Pentateuchal lesson verse by verse; from the Prophets he translated three verses at a time. While the reader of the Hebrew text was forbidden to recite by heart, the meturgeman was not permitted to read his translation from a book, or to look at the Hebrew text when translating, in order that the people should not think that the translation was contained in the text. The meturgeman was also forbidden to raise his voice higher than that of the reader of the text. He did not limit himself to a mere literal translation, but dilated upon the Biblical contents, bringing in haggadic elements, illustrations from history, and references to topics of the day. This naturally required much time, to gain which the weekly lesson had to be short, so that the Pentateuch was finished only in a cycle of three or three and one-half years; while the portion from the Prophets was frequently abbreviated. The free handling of the text, which frequently changed the translation into a sermon or homily, gave the meturgeman ample opportunity to introduce his subjective views into the lesson; and with the multiplication of sects this became distasteful to the Rabbis. The increase in the opposition to the meturgeman led to the fixation of the Targumim and to the demand that the meturgeman keep strictly to mere translation. But a mere translation satisfied neither the public, who had known the text from early school-days, nor the meturgeman, who was deprived of an opportunity to parade his knowledge and to display his oratorical gifts. As a consequence the "darshan," or preacher, was introduced; and the literal translation fell gradually into disuse. 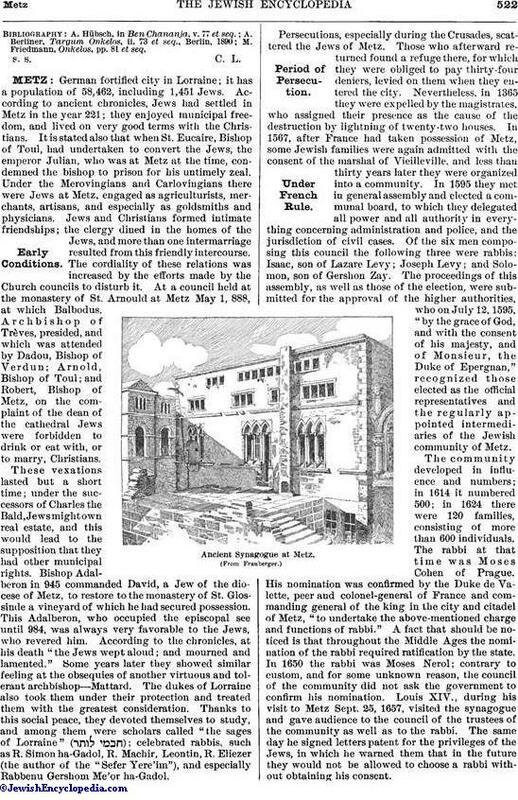 While the meturgeman as Bible interpreter was a purely Palestinian institution, as interpreter of the Mishnah he was known also in Babylonia, where he was called Amora. The head of the academy, while seated, would tell him in Hebrew and in a low voice the outline of his lecture; and the meturgeman would in a lengthy popular discourse explain it in the vernacular to the audience. It is noteworthy that the meturgeman, whether explaining Bible or Mishnah, was not held in much esteem by the public; and in Talmud and Midrash he is frequently referred to with contempt. See also Targum. M. Friedmann, Onkelos, pp. 81 et seq.